I felt like I entered a Disney movie this weekend. 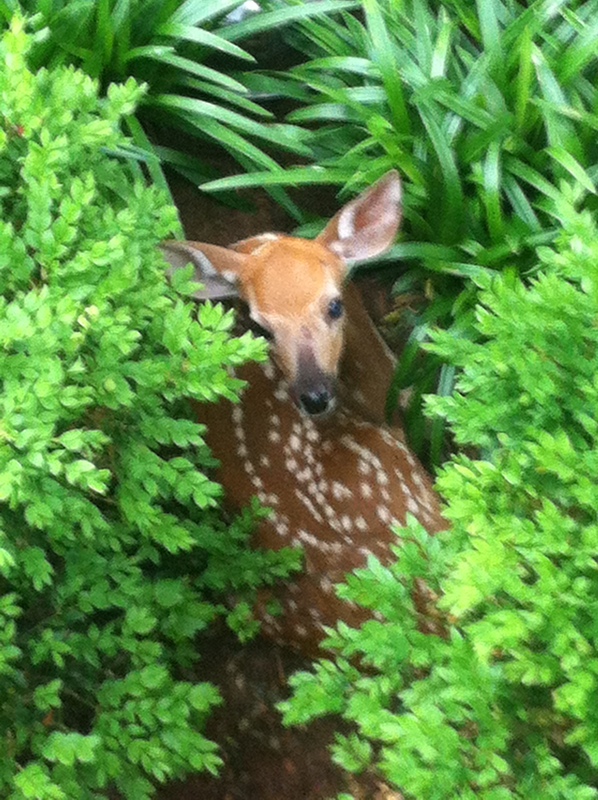 While working in our garden, my wife, Rita, discovered a baby deer curled up and nestled in the Azaleas right in front of our house beneath our front steps. The deer was tiny, about the size of our beagle, Maggie. It was about 2 o’clock in the afternoon and we had no idea how she got there or how long she’d been hiding. After a few tweets, Facebook and social cam posts, we began to wonder what, if anything we should do about the situation. Should we just leave her alone and hope the mother returns? Do deer mothers return when separated from a baby? Might she be ill and was left to die? Could she find her own way back to nearby Rock Creek Park? We finally decided to give her water and some veggies, both of which she ignored, and wait. I decided that, if she was still there the next morning, we’d call animal control. We then went about our business. My son, Danny, however, began to get very concerned. He determined that her breathing was labored and he worried about her health. So he called animal control and they promised to send someone. Of course, this is the District of Columbia, so no one ever came, but that’s another story for another blog post. We continued to check on her periodically. She remained curled up, occasionally popping her head up, presumably wondering of Momma would be coming. Deers by nature always look scared, but this little deer looked terrified. It was a bit heartbreaking imaging what might be going through her little deer mind. And I expected that we’d come out the next morning and find a tiny dead deer in our garden. Then what? Dump her in the trash? No, I supposed I’d have to dig a grave in the 90 degree heat in Rock Creek Park. Sigh. Then, I went out at about 7 pm and she was gone. Partly relieved and partly concerned, I set off down the street in case she was wobbling along alone on her own four feet. 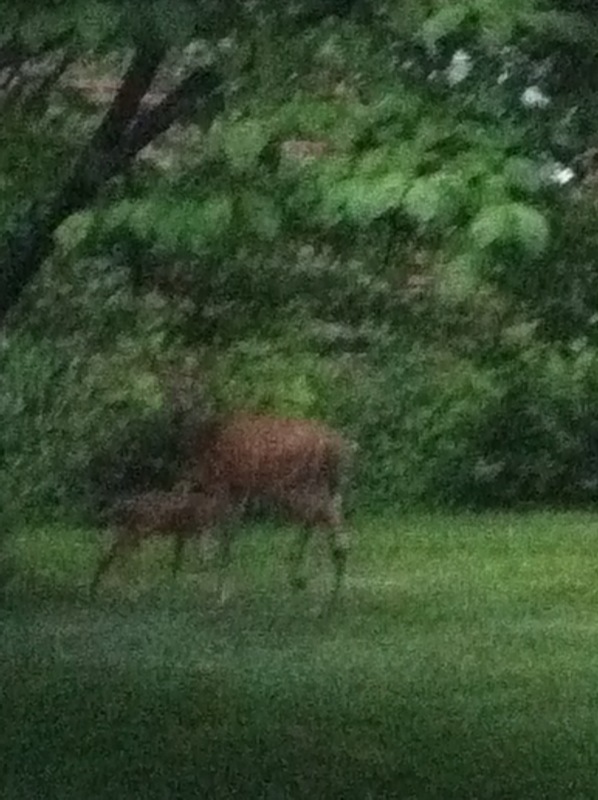 About a half a block down the street, I thought I glimpsed a full sized deer and proceeded quietly until I noticed that, sure enough, there was Momma, with the baby right beside her. What a beautiful sight! The mother had returned, collected her baby, they were on their way home. All was right with the world. You have to peer closely, but the picture at the right shows the mother and child together. And, it’s even harder to see the video below. But if you look closely at the very middle of the frame in front of the car, you’ll see two figures that are the mother and baby deer. Then, after my short walk, you might be able the two of them disappear behind the house on the right. What a device, the IPhone to be able to capture the wonder of nature this way.